Lawrence is my new favorite next door city. Living in Lowell for over a decade I of course had been there multiple times, but never really “went”. It was incredible to just spend the day roaming around a city I thought I knew so much about but really knew nothing. Joining me for the adventure in Lawrence were two dear friends, one a fellow blogger- Sondria from Lunenburg and another who is one of my main hype women, Aleksandra from Lowell. Together we explored a city, and enjoyed every minute of it. From Italian bakeries to antique malls and everything in between, Lawrence is full of history. Good history. So how did Lawrence come about? Well it became an official city in 1853 and thrived first off the textile industry and then later foodstuffs, paper products, footwear and more. It is also part of the Merrimack Valley ( any towns along the Merrimack River are part of the Merrimack Valley) which make it easily accessible via highways and back roads as well. Lawrence is also a community built on a long history of immigrants, which up until the 1920’s had been primarily Europeans, Canadians & the British. Immigration had mostly ceased due to restrictions but then picked up again the 60’s when the Cubans, Puerto Ricans, Dominicans and Vietnamese settled there. Because of this diversity throughout the city you see a cuisine all over the spectrum that brings amazing flavor and uniqueness. I love that about Lawrence; it really holds one of the keys to my foodie heart. As a Latina, I identify quite a bit with Lawrence because of the large population of Latino/Hispanic residents. 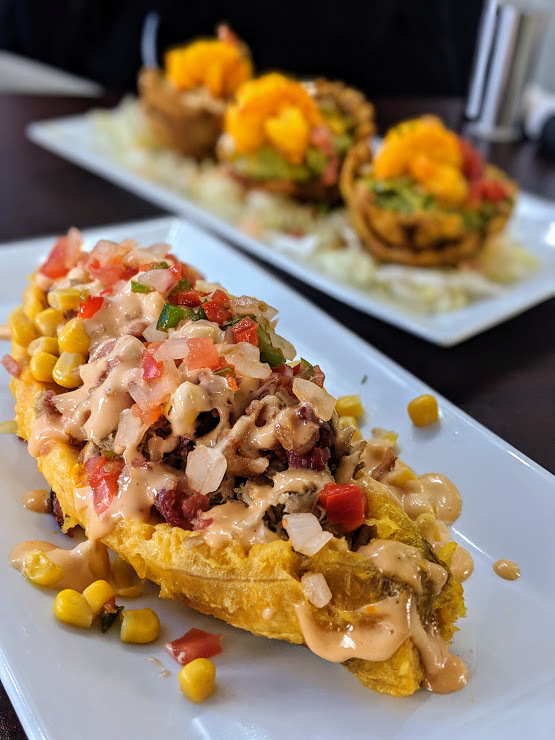 I felt incredibly connected to the food (Puerto Rican/Dominican eateries, bakeries etc.) every time I had visited in the past, but beyond the food I had never really explored the city. That’s what was missing- to be an explorer willing to go beyond limits and try all sorts of new things from different parts of the city. Even with the whole day spent there I still didn’t get a chance to go everywhere I wanted to- that should tell you something. Lawrence has for many years been the smaller sister of Lowell and I have noticed it never really gets talked about in the way it should. Art is booming, people are growing, new restaurants are opening up which makes for an inviting atmosphere. During this trip I went to several places to try and get a glimpse of the culture that is “Lawrence”. The vibe, the people and to find an overall understanding of what it means to be from Lawrence. What I found is that people there take pride in what they make, what they sell, what they cook and in the end; what they have to offer. Its vast. I couldn’t eat one delicious treat fast enough before another was presented. People went out of their way to help me and my friends and it reminded me of being in a community of extended family. Because in the end community is really what its about, you can go anywhere in the world but if you don’t feel welcome or loved- then whats the point? Lawrence thank for having me, you welcomed the Maven with open arms, you showed me how much you love each other and how much you love your city. I love your food, your murals, your people and drive you have to succeed in everything you do. So I hope you will enjoy what I have experienced in your city and the treasures I found. A small breakfast joint located on a busy corner, Eli’s place was bustling with patrons when we went on a Saturday morning. The hash was absolutely delicious and we ordered the quintessential New England item of baked beans as one of our sides. ( They were sweet and tasty) As a table we shared the Reeses pancakes ( which were huge by the way) and so freaking delicious! Absolutely loved the food, the service and the vibe. Must visit for breakfast! I have an obsession with murals and street art. Simply because I feel like art can speak to all of us in a way unique to each of us. Art means different things to different people which is why I loved the diversity of the street art and murals in Lawrence. They each meant something different to me and I really enjoyed driving up and down Essex Street ( where a lot of them are located) to check them out. Close up of this one because I loved it. One of my favorite places in Lawrence is the dope coffee shop that serves delicious food, has a small little library you can buy books from, supports artists and their art and so much more. We sat and chatted about our unique cultures how they connect and had some really good times there. I also can’t get over how good that Dominican hot chocolate was… Shout out to Nick who was super helpful to us the whole time we were there!! Each table has a paper roll on it so you can do your own works of art. How hot drinks should be done…. This bakery has been in Lawrence since 1915 and is family run. An Italian bakery full of delicious goodies and honestly the best canolis I’ve had yet. The canolis are hand stuffed when you ask for them and we each ordered the traditional cheese filling- which in my opinion is the only way to go. Also we got a box of assorted cookies and all of them were SO GOOD. I ate way too many of them. Aleks bought the special sfogiatelle which are frozen and then baked later. So guys, I am obsessed with this place. They have some inventive Spanish food that literally made all of us drool. Stuff I’ve never even had before including a stuffed WHOLE plantain that was so incredible in its goodness I wanted more. They have a pretty large menu, really cool wall art and great service. I also loved the murals on the walls of singers, rappers etc. From Biggie to Celia Cruz to Cardi B 🙂 They are a brand new place- so go support! Tiny little spot but bursting with delicious smelling food. The sweetest lady behind the counter, Georgina was an absolute doll. I ordered a really homey dish that reminded me of being in my Abuela’s house and we took some flavor filled bites before taking the rest home for later. While it was covered in snow, I still enjoyed the view of the city from up there. The sun was setting and was shinining on the city scape below. Its a quick detour to see some lovely views. Known for their Sobao bread ( a sweet bread popular in Puerto Rico) they also have many other baked goods. When we got there they had a few things left and I snagged a cinnamon roll with cream cheese & pineapple. OH DEAR HEAVENS. Amazing. Definitely a must visit if you head on over there. All in all a great trip to Lawrence with some great gems. Other places to visit would be Blochaus Art Gallery, Essex Art Center, Lawrence History Center, Garden House Korean Restaurant, and El Encanto Restaurant. Hope to hear all about your adventures to Lawrence…till next time! There is so much to do in Lawrence! Ill have to go on my next visit 🙂 Thanks for stopping by! So glad you stopped by and that you enjoyed it. There is so much in Lawrence- I definitely have to keep going back. So glad you stopped by!!! Ty so much! What a great blog! Thank you for highlighting Lawrence. One more stop to add to your list….a trip to Uncommon Closet, a FABULOUS little boutique that sells high-end (and just plain fun) new and gently worn women’s clothing and accessories at incredible prices. All proceeds benefit http://www.uncommonthreads.org a women’s empowerment program. The Closet is open Wednesdays and Fridays from 10-2 and there will be a HUGE 50% off sale on Saturday March 9th 10-1. Hope to meet you! Oh! Thanks so much for stopping by, Ill have to check it out and would love to meet you!